The Park Summit, hosted by Park People and sponsored by TD Bank Group, is Canada's largest gathering of park champions. The annual event brings together park experts – from designers to community leaders -- to share innovative ideas and approaches on how to foster inclusive, urban green spaces. This year the theme of the Park Summit was about cultivating play in parks. The following article highlights some of the key learnings from the 2018 event. Ralph Waldo Emerson got it right when he said: “It’s a happy talent to know how to play.” This year’s Park Summit presenters have this talent nailed down. Each has a unique ability to cultivate playfulness among targeted audiences to reach particular goals. Yes, it can feel odd to speak so seriously about play, but creating intentional outcomes using play requires serious planning and consideration. As speakers from both Montreal and Toronto demonstrated, it’s critical to determine what you want to achieve through play to deploy it most effectively. The presentations our Park Summit speakers shared offer many lessons for those of us trying to figure out how to use play to create impact -- both among park and public space users and the key stakeholders who make decisions about how space does, and does not, get used. Sometimes the snowy laneway is a cocoon formed of active play like hockey or fort-building, and other times it’s a cocoon of warm, delicious food that seduces people to leave their living rooms and come outside to break bread. Marie-Hélène highlighted the seductive powers of food in particular when discussing Ruelle No 13 project’s participation in Restaurant Day, a worldwide festival of people organizing their own pop up food events in shared spaces. Bringing Restaurant Day to the snowy laneway helped Ruelle No 13 lure people into the space to enjoy the benefits of gathering together and experiencing new possibilities for their shared, underused space. Janelle, from Green Change at Toronto’s Jane-Finch Community Centre, has her own take on what it takes to entice people to play together. In short, Janelle’s strategy is: just keep showing up. When Janelle was trying to activate Oakdale Park, a large, but underused park in the Jane-Finch neighbourhood, she made a point of being consistently present in the park. Being in the park, day in and day out, allowed people in the neighbourhood to get to know Janelle, and eventually engage in conversations and build trust. Gradually, Janelle was able to connect with neighbourhood kids who had a vested interest in the park’s success. The kids collectively worked on securing a shade structure for their park. With Janelle’s guidance, the kids collected data, built prototypes and spoke to the local City Councillor to advocate for the shade structure. Spoiler alert: they got it!! Janelle treats children like “park royalty” because they know their park and understand its inner workings more than we ever give them credit for. This approach to kids allows Janelle to tap-into their wisdom, energy and unique perspective, and harness it to make the park better for the entire community. "As soon as we physically engage with – maybe even shape – our environment, it changes our relationship with this space. Active engagement creates a sense of control over our environment. And with this control comes a sense of security, of ownership, of belonging." As Lisa emphasized, “active engagement” can be as simple as throwing rocks or as complex as an organized scavenger hunt. These experiences help build newcomers’ relationship to a new geography and establish a new sense of home. Caroline Magar, Development Coordinator at Montreal’s Les Amis du Champs des Possibles, had advice on how park groups can “play well with others.” In particular, Caroline’s presentation underscored the importance of understanding how to influence stakeholders and build a shared vision of a public space. 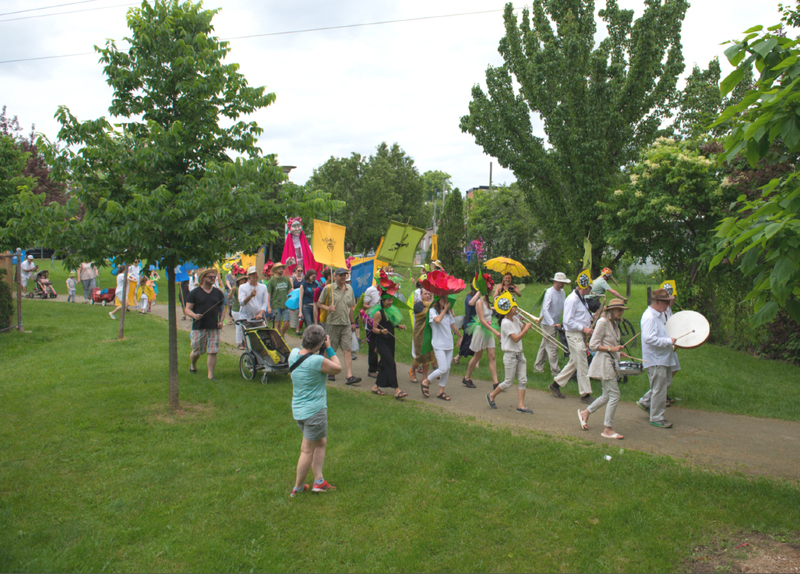 Les Amis du Champ des Possibles has transformed a Montreal rail line into a semi-wild place where people can experience nature in a high-density neighbourhood. However, historical contamination has limited the groups' ability to host formal events in the space. Caroline has taken it upon herself to become an expert on contamination issues and how to remediate the land in order to have credibility among key stakeholders and make informed decisions about the land’s future. Embracing the more scientific and technical dimensions of the project has been a tremendous help in turning an unusual and inspiring space into a public place where people can safely experience the wild. Finally, in her keynote presentation, Mouna Andraos, co-founder of design studio daily tous les jours, shared how her projects deliberately diverge from conventional ideas of play in order to appeal to audiences who may otherwise be reluctant to join in the fun. In fact, Mouna specifically took aim at the word ‘play’ because it’s a term that is generally associated with children. In her experience, the term can undermine the seriousness of creative endeavours, like those of her firm. The large, public installations that Mouna and her team create using cutting edge technology in public spaces utilize unexpected adult colours and are situated in public places not generally associated with play. These interactive installations are able to seduce adult audiences because they are unlike other objects we conventionally associate with play. "The result is an immersive, light animated, crowd-sourced concerto. It is a poetic exercise that encourages slowing down and engaging all the senses with the nature that surrounds us." Mouna’s presentation highlighted that creating new ways to play requires having systems in place that support creative exploration and collaboration. She specifically pointed to the Quartier des Spectacles district in Montreal, which created a centralized permitting department to provide a one-stop-shop for artists, park groups and community groups to secure the permits and permissions necessary to activate the space. The simplicity of this model allows groups who may not otherwise be willing or able to go through multiple bureaucratic processes to bring their vision to life. All in all it was an awesome Park Summit. Thank you to the 400+ people who attended and who work diligently to activate the power of parks in Toronto, Montreal, and across Canada. Also, thanks to the many presenters and our moderator Christina Hug, who made us look so good. A very special thank you is owed to our Presenting Sponsor, TD Bank Group, who has supported the Park Summit from the start and makes it possible for us to host this incredible event.